Hearts and birthstone jewelry for family members. Also personalized rings, necklaces and bracelets. Now there's a stylish personalized birthstone bracelet for Mom that lets her celebrate the sparkle, color and joy that her family brings each day. This unique child name-engraved jewelry is a fine jewelry exclusive from The Bradford Exchange. 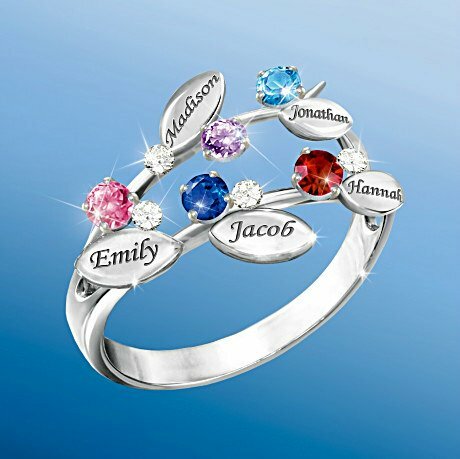 It lets a mother show her pride not only with her children's birthstones, but also with their names! With two kinds of personalization, this bracelet becomes a one-of-a-kind design - and best of all, each child is represented not just by one sparkling birthstone charm, but by two of them! As seen on Lifetime Television's "The Balancing Act. "This personalized birthstone bracelet for Mom features heart charms richly plated with gleaming sterling silver, each engraved with a child's name. On the surface of each heart is a second heart, plated with 24K gold, that holds a sparkling Swarovski® crystal birthstone. Each heart charm is paired with a matching roundel charm, also embellished with crystal birthstones. Select up to 6 names and birthstones for your bracelet, and then enjoy the added beauty of 2 additional charms - a delicate, dangling open heart charm, and a 24K gold-plated "Love" charm. Strong demand is expected for this child name-engraved jewelry that makes the perfect mother jewelry gift, so order now! Your wonderful granddaughter has your whole heart, and there's nothing you want more than to see all of her dreams come true. Now, capture your granddaughter's imagination with a custom jewelry creation that will show her anything is possible: the Believe in Your Dreams Pendant Necklace, a fine jewelry design exclusively from The Bradford Exchange. A fashionable way to remind your granddaughter you love her, this faceted crystal pendant is even personalized with your granddaughter's name on a heart charm near the clasp! Finely handcrafted, this lovely pendant features an intricately faceted crystal heart attached to a solid sterling silver bail. Held within the heart is the gorgeous fantasy artwork of Mimi Jobe that features a magnificent unicorn and a sweet fairy. It is sure to enchant your granddaughter! The back is printed with the sentiment, "My Dear Granddaughter Believe in Your Dreams Anything is Possible". An 18-inch solid sterling silver chain completes this stunning design. 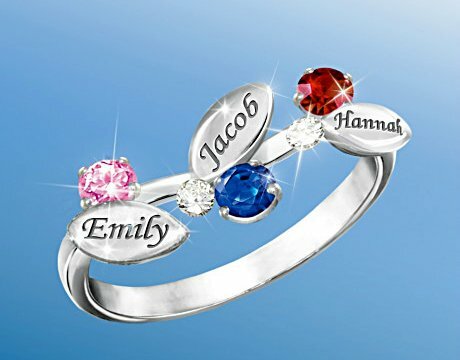 Strong demand is expected for this personalized granddaughter jewelry, so don't wait! Order now! Show your granddaughter how much you love her by letting her know whooo loves her with the Granddaughter Owl Always Love You Pendant Necklace, a fine jewelry design exclusively from The Bradford Exchange. Lavishly plated in sterling silver with rich 18K gold-plated accents, this owl necklace is a real hoot and a wonderful way to express your love for your granddaughter. This adorable pendant necklace features a hand-painted enameled owl with dazzling genuine Swarovski crystals all over the owl's round belly. Plus, the owl's head and body really move and the wings actually flap! Hanging at the owl's side is a sterling silver-plated heart charm that is engraved with "Owl Always Love You!" and a Swarovski crystal accent for extra sparkles. This lovely granddaughter necklace comes with a delicate, matching 18" sterling silver-plated chain to complete this feathered friend's look. Your Granddaughter Owl Always Love Your Pendant Necklace arrives in a velvet jewelry pouch and gift box, perfect for safekeeping and gift giving. Strong demand is expected. Order now! You wish only the very best for your precious daughter - success, true love, happiness - always encouraging her to reach for the stars. Now, you can give her a heartfelt reminder that the sky's the limit for anything she puts her mind to with the Daughter Reach for the Stars Pendant Necklace, a fine jewelry design exclusively from The Bradford Exchange. This beautiful Daughter Reach for the Stars cabochon stone necklace is handcrafted in solid sterling silver and showcases a dazzling, cabochon blue goldstone that appears to flicker with golden light from within its dark velvety blue depths. On the surface of the cabochon stone is a pave of sparkling crystals that create a dazzling shooting star swirl, symbolic of your daughter's limitless potential and power to reach for her dreams. A loving reminder for your daughter that anything is possible, this stunning sterling silver star necklace is sure to become a cherished keepsake. This unique daughter necklace even arrives in a custom gift box, perfect for safekeeping and gift-giving, along with a lovely poem card that reads: "My Dear Daughter Reach for the Stars Anything Is Possible I Love You." Strong demand is expected. Order now! The love your family shares grows stronger every day and brings you closer together! Now, fashionably celebrate your special bond with the United by Love Personalized Bracelet, a fine jewelry exclusive from The Bradford Exchange. A dazzling way to keep your family's love close at hand, this family birthstone bracelet is customized with up to 6 engraved names and Swarovski® crystal birthstones to create a one-of-a-kind family tribute.Exquisitely handcrafted in a custom design featuring multiple strands of braided genuine leather, this personalized family bracelet boasts 18K gold-plated beads that gleam with the engraved names and coordinating crystal birthstones of your loved ones. Bracelets with less than 6 names and birthstones will be set with clear crystals for added glamour. To enhance this unique design, three dangling heart charms are each engraved with the word: "Love", "Joy" and "Hope" and a heart charm at the magnetic clasp sparkles with a white Swarovski crystal and the engraved sentiment "My Family, My Joy". It arrives in a velvet jewelry pouch and gift box, perfect for safekeeping and gift giving. Eager demand is anticipated, so don't delay! Order now! If your family shares an all-embracing love that's a constant source of pride, let this exquisite birthstone family ring express those feelings in a personal and elegant way. This exclusive personalized family ring shows off your family with a distinctive, shimmering "wave" design, each wave engraved with a loved one's name as it cradles his or her cubic zirconia birthstone. This fine jewelry exclusive from The Bradford Exchange also presents a touching family sentiment engraved inside the personalized family ring, to make its message of love all the more complete. Expertly crafted in solid sterling silver with elegant touches of 24K-gold plating, this unique personalized family ring allows you to customize up to 6 waves of the ring design, each engraved with a family member's name and the sparkling cubic zirconia birthstone of your choice. The inside of this elegant birthstone family ring is engraved with the sentiment "Our Family is a Circle of Love," the perfect message to complement such a unique ring design. 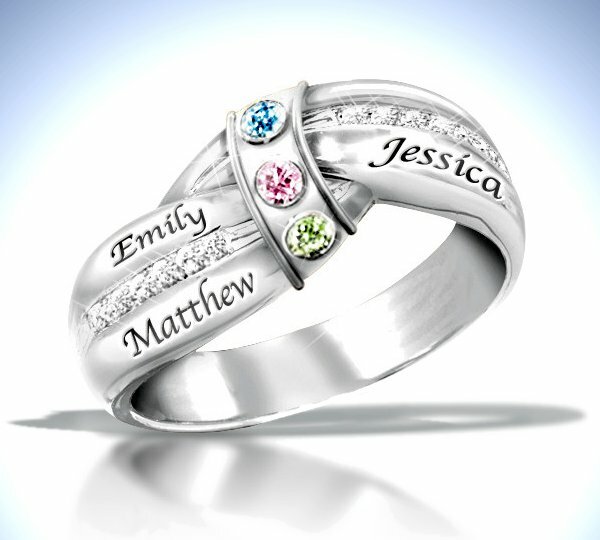 To create your own personalized family ring that is destined to become a treasured keepsake for generations, don't wait. Demand for this level of personalization is likely to be high, so be sure to order now! Because your family creates a circle of love that is caring and nurturing, celebrate those special qualities with this stunning birthstone family bracelet! This exclusive personalized family bracelet features a distinctive, shimmering "wave" design, with each wave engraved with a loved one's name as it cradles his or her cubic zirconia birthstone. This fine jewelry exclusive from The Bradford Exchange also presents a loving sentiment engraved inside this birthstone bracelet with names, so that the wearer is forever reminded of how much her family really means to her.Richly plated in sterling silver, this unique personalized family bracelet allows you to custom-order up to 6 waves, each engraved with a family member's name and the sparkling cubic zirconia birthstone of your choice. 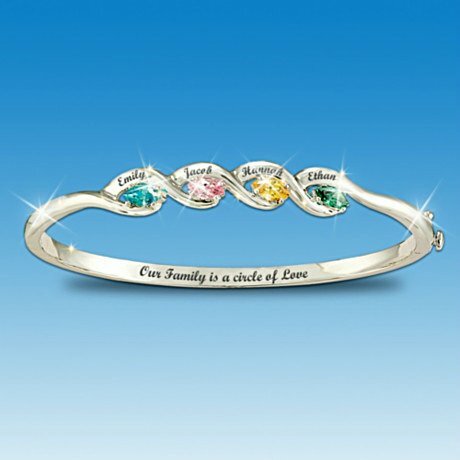 The inside of this graceful personalized family bracelet is engraved with the words "Our Family is a circle of Love," a perfect sentiment to complement this birthstone family bracelet design that circles the wrist with such elegance and style! To create a personalized family bracelet that will surely become a treasured keepsake as well as a family heirloom, be sure to order now! You wish nothing but the very best for your precious granddaughter - success, true love, happiness - always encouraging her to reach for the stars. Now, you can give her a lovely reminder that the sky's the limit for anything she endeavors with the Granddaughter Reach for the Stars Pendant Necklace, a fine jewelry design exclusively from The Bradford Exchange. This beautiful Granddaughter Reach for the Stars cabochon stone necklace is handcrafted in solid sterling silver and showcases a dazzling, cabochon blue goldstone that seems to flicker with golden light from within its dark velvety blue depths. On the surface of the cabochon stone is a pave of sparkling crystals that create a dazzling shooting star swirl, symbolic of your granddaughter's limitless possibilities to reach for her dreams. A loving granddaughter gift and reminder that anything is possible if she sets her hopes high, this stunning sterling silver star necklace is sure to become a meaningful keepsake she'll always cherish. This beautiful granddaughter necklace arrives in a custom gift box, perfect for safekeeping and gift-giving, along with a lovely poem card that reads: "My Dear Granddaughter Reach for the Stars Anything Is Possible I Love You". Strong demand is expected. Order now! The brilliance of genuine diamonds radiates the love you feel for your family, in a bracelet design that celebrates your loved ones in an exciting, elegant way. 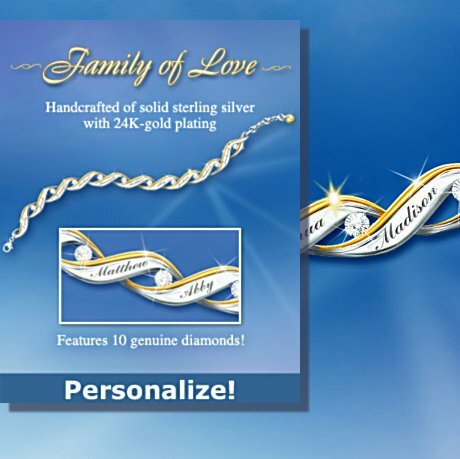 The Family of Love personalized diamond bracelet is a fine jewelry exclusive from The Bradford Exchange with personalized engraving for up to 10 names. Imagine the names of your loved ones surrounded by 10 genuine diamonds to create a truly one-of-a-kind bracelet design! As seen on Lifetime Television's "The Balancing Act. "Exquisitely handcrafted and richly plated with sterling silver and 24K-gold accents, this Family of Love bracelet features 10 diamonds set between gleaming, wave-shaped links. You create a special keepsake by personalizing your diamond bracelet with up to 10 elegantly engraved names. This diamond bracelet arrives in a custom case with gift box, making it a perfect gift that is destined to become a family treasure. Strong demand is expected, so order now! This personalized family ring lets you design your own ring to create a "family tree" that's yours alone! Each of these family birthstone rings features a unique branch motif with leaf designs, in a style that is individually customized to represent your loved ones. n each leaf design, this personalized ring pairs an engraved family name with a loved one's cubic zirconia birthstone for a very special custom look. This family birthstone ring is a fine jewelry exclusive from The Bradford Exchange that provides a beautiful way to express a family love with deep roots.Exquisitely crafted in solid sterling silver, this personalized family ring presents gleaming individual leaf designs that showcase up to 7 engraved names of loved ones along with their cubic zirconia birthstones. Then clear CZ "dewdrops" are added to the leaf design for extra sparkle in this unique family birthstone ring design! Enjoy the thrill when you design your own family ring from the various leaf designs offered, knowing that your ring will be one-of-a-kind, just like the loving family that inspired it! Demand is expected to be high for this unusual family birthstone ring, so be sure to order now! Just like flowers need water to blossom, your family flourishes with the love and nurturing care you provide. Now you can wear a radiant reminder of your precious loved ones with the Our Family Is a Garden of Love Personalized Bracelet, a handcrafted fine jewelry creation exclusively from The Bradford Exchange. This unique birthstone bracelet is customized for your family with personalized engraving and Swarovski crystal birthstones for each family member. Plus, it's engraved inside with the title sentiment for a touching reminder of the importance of family.This meaningful women's jewelry design is richly plated in sterling silver with 18K gold-plated accents and handcrafted in an exclusive design. It features entwined ribbons engraved with your loved ones' names, with an elegant heart at the center framing a bouquet of birthstone "blossoms." Each flower is crafted of 5 Swarovksi crystal birthstone "petals" and a clear crystal in the center, creating a sparkling garden of love. Don't miss this hinged birthstone bracelet. Strong demand is expected, so order now! A mother's faith in God and her blessed gift of children are two things she cherishes. What more beautiful way to express her devotion to faith and family than with this personalized mother's pendant necklace, a fine jewelry design available exclusively from The Bradford Exchange. 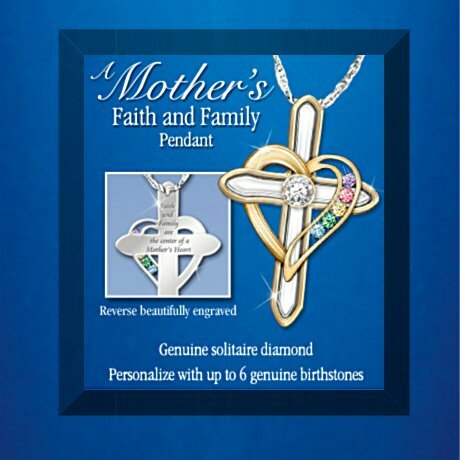 This diamond and birthstone pendant for mom keeps all her blessings close to her heart when it's personalized with up to 6 genuine birthstones representing each family member.Expertly handcrafted of solid sterling silver and accented in 24K-gold plating, this radiant mother's pendant necklace showcases a stunning heart and cross design. A sparkling genuine solitaire diamond graces the center of the cross, while the selected birthstones cascade down the side. A touching ode to mom is even engraved on the reverse side of this perfect jewelry gift for mothers. Strong demand is expected. Order now! Your family fills your heart with a love that grows more beautiful as time goes on. Celebrate that wonderful bond with an exclusive family tree necklace created just for you - the Family of Love Personalized Birthstone Necklace. It features a unique tree-shaped pendant that is customized to represent your own family tree with engraved names and crystal birthstone charms. What a beautiful way to express your love for your cherished family!A fine jewelry exclusive from The Bradford Exchange, this personalized pendant is exquisitely crafted in solid sterling silver. A crystal birthstone charm representing each family member gracefully sways from a sterling silver "leaf" that is elegantly engraved with his or her name. The pendant can accommodate up to 7 names and birthstones and includes an 18-inch chain of solid sterling silver. Don't wait to order this engraved jewelry design that's as unique and precious as your family. Strong demand is expected, so order now! Your family is held together by a special connection that keeps you in each other's hearts. Now, you can celebrate that meaningful bond with the Together With Love Personalized Diamond Pendant Necklace, a fine jewelry exclusive from The Bradford Exchange. 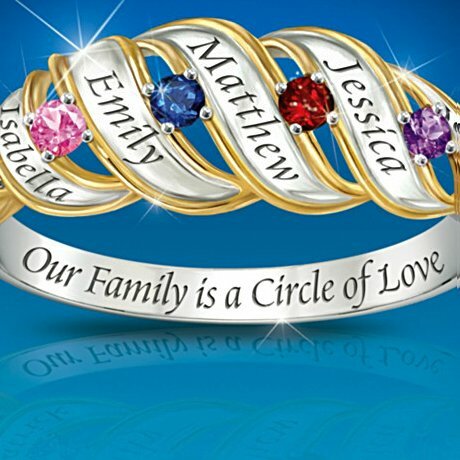 What makes this personalized family heart pendant so special is that it is customized with up to 6 engraved names and their crystal birthstones to create a beautiful one-of-a kind expression of your family bond. Expertly handcrafted of solid sterling silver, this family birthstone necklace features a unique open-heart design that sparkles with circle-shaped birthstones swaying in the center. A genuine diamond is set at the bottom of the heart, while the names of your family are engraved on the front. In addition, "Our Family is held together by Love" is elegantly engraved on the reverse of the heart pendant, adding more meaning to your family birthstone necklace. Strong demand is expected for the Together With Love Personalized Diamond Pendant Necklace, so don't wait to honor your beloved family. Order now! The love you have for your precious family reaches to the sky. Now, our I Love My Family to the Moon and Back Personalized Diamond Family Pendant Necklace lets you wear a shining symbol of the joy that each and every family member brings to your life. This Bradford Exchange exclusive fine jewelry creation features an elegant crescent moon design that is engraved with the names of up to 6 family members, making this pendant a truly personal celebration of the ones you hold dearest.This custom engraved family pendant necklace is handcrafted of solid sterling silver with a textured pave design, embellished by a beaded border and gleaming inside edge. Sparkling with a genuine solitaire diamond, the pendant features a silver pave heart that suspends from the moon and is engraved on the reverse with "I Love You to the Moon and Back." The reverse side of the moon is engraved with the names of your family. Complete with an 18-inch solid sterling silver chain, the pendant necklace arrives in a velvet jewelry pouch and gift box, accompanied by a touching sentiment card. Strong demand is expected. Order now! A family is a never-ending circle of love! Now, wear a dazzling celebration of those who mean the most to you with the Mom's Forever Love Personalized Pendant Necklace, a fine jewelry design exclusively from The Bradford Exchange. 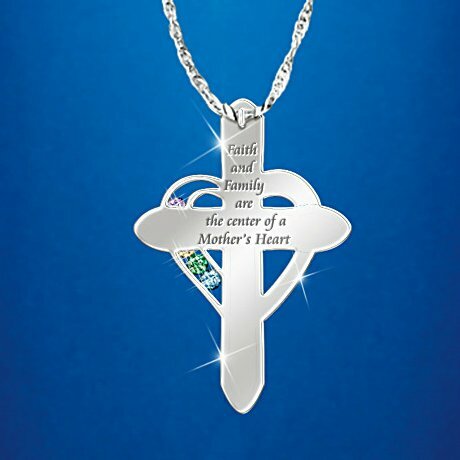 Featuring a contemporary ring-shaped design, this unique triple-band pendant may be personalized with up to 6 engraved names for a sparkling tribute to your beautiful family!This personalized mother's pendant necklace suspends from an 18" solid sterling silver chain and is handcrafted of solid sterling silver and enhanced with 18K-gold plating. 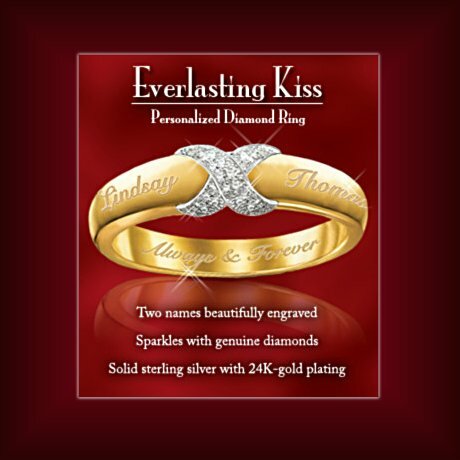 Six heart-shaped genuine Swarovski® crystals framed in 18K-gold plating sparkle around the center band, while the names of your loved ones are engraved around the 18K gold-plated outer bands. For an extra special touch, the inside of the pendant is engraved with the touching sentiment, "A MOTHER HOLDS HER CHILDREN'S HEARTS FOREVER." Strong demand is anticipated, so don't delay. Order now! Here's a fashionable way for a mother to "stack up" her loving feelings for her precious family, with this personalized mother's birthstone pendant that sparkles with the beauty of Swarovski crystals. This fine jewelry exclusive from The Bradford Exchange is an elegant birthstone pendant for Mom that features a personalized roundel charm for each child or family member. Enhancing this unique personalized pendant is a gleaming heart charm that anchors the pendant necklace design with a loving family sentiment.This elegant birthstone pendant for Mom is exquisitely crafted and richly plated in sterling silver with accents of 24K-gold plating. You may order up to 6 removable, interchangeable roundel charms, personalized with the engraved names and Swarovski crystal birthstones that you specify. Your personalized mother's birthstone pendant also includes a sterling silver-plated heart charm to anchor the stacking roundels, with the word "Love" engraved on one side, and "My Family, My Joy" on the other. A sterling silver-plated chain, adjustable up to 24 inches, completes the elegant fashion look. Because this birthstone pendant for Mom is destined to become a family treasure, high demand is expected, so don't miss out. Be sure to order now! Family is the joy of life, a precious jewel that outshines the brightest treasure. Now, our Precious Jewel personalized photo pendant necklace offers you an exquisite and timeless way to capture the love that fills your heart. A fine jewelry design only from The Bradford Exchange, this unique personalized photo jewelry lets you upload a favorite photo of precious family members, which will be embedded inside a beautiful crystal heart-shaped pendant. Then, up to two lines of names, messages or dates of your choice will be elegantly engraved in script on an accompanying heart charm at the clasp, to create a stunning fine jewelry original.Exquisitely handcrafted, your personalized photo pendant necklace features a faceted crystal heart that showcases your personal photo. A genuine solitaire diamond sparkles at the top of the pendant, embraced within a solid sterling silver ribbon design, and the necklace closes with a lobster claw clasp for a stunning finish. This breathtaking personalized photo jewelry is a meaningful keepsake to wear now and to share with generations to come. It even arrives in a velvet jewelry pouch with a custom gift box. Don't miss your chance to create a beautiful family heirloom. Strong demand is expected, so order now! Your grandchildren fill your heart with a love that grows more beautiful with each passing day. Now, celebrate the blessings of being a grandmother with a birthstone pendant made just for you. Introducing the My Heart Belongs To My Grandkids Personalized Pendant Necklace, a fine jewelry exclusive from The Bradford Exchange. An elegant keepsake and the perfect gift for a grandmother, this personalized jewelry treasure features a delicate heart-shaped pendant that is customized with the names and matching crystal birthstones of up to 15 grandchildren!Handcrafted with lavish sterling silver plating, this elegant tribute to grandma is a sparkling birthstone pendant of unique design. The central heart is engraved with each grandchild's name on one side, with the sentiment "My Heart Belongs to my Grandkids" on the other. A detailed openwork design of joined hearts surrounds the central heart, ready to hold each grandchild's Swarovski crystal birthstone..The pendant can accommodate up to 15 names and birthstones and suspends from an 18-inch sterling silver-plated chain. A sparkling celebration of a grandmother's love for her grandkids, this personalized jewelry treasure arrives with a velvet pouch and gift box. Strong demand is expected, so don't wait. Order now! Like diamonds, a perfect kiss should last forever! Now it can with this special personalized diamond ring exclusively from The Bradford Exchange. Glittering with genuine diamonds, this custom engraved ring is a symbol of your everlasting affection and made just for you with your two names elegantly engraved on the outside band.The design of this personalized couples ring for her is classic, but the personalization is yours alone for a fine jewelry design as special as she is! Crafted in solid sterling silver, this custom engraved ring dazzles with rich 24K-gold plating and a pave of genuine diamonds. Finished with a heartfelt sentiment inside the band, it makes the perfect romantic jewelry gift for her. Hurry, strong demand is expected. Order now!